Imagine having the emotional state of happiness, confidence, and purpose in the snap of your fingers... without even trying at a conscious level. It's possible, if you put your unconscious to work for you. Are you ready for the Unstoppable You ? Introducting a brand-new transformational program for designing your life with more wealth, more happiness, and deep emotional fulfillment...from the inside out. For a limited time, this brand new 23 module video/ audio/ book program is available for instant access at over 70% off retail. If you are wondering why most self-help programs fail on their promises.. If you have ever wondered why affirmations work less than 50% of the time.. If you are looking for the most compelling and fascinating journey into the mind since Anthony's Robbins or Wayne Dyer's best selling courses were released... this is it. 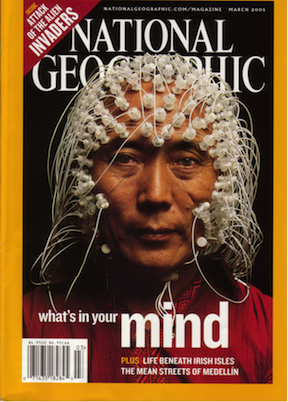 Finally, you can program your own the unconscious mind... so the next 10 years looks very different from the last 10 years. Inside, you will discover how to really change your own belief systems, attitude, and core personality traits at the level. Inside this course, I give you 4 core tools and dozens of smaller excercises and games that will help you and your clients or friends in making change fun. What's more the SIDE EFFECT of this program seems to be that people experience more financial abundance, they get in the "flow", and their careers suddenly take off! 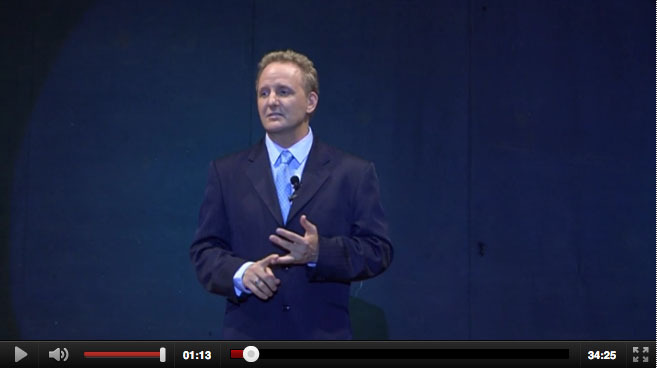 Program Introduction Video and the 2015 TEDx Talk "Neuro-Pathway to Happiness." 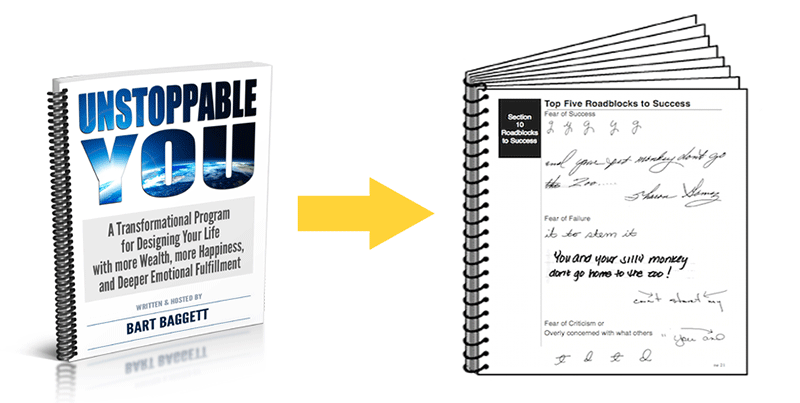 Get all the basic information you'll need to know to succeed in the Unstoppable You program. 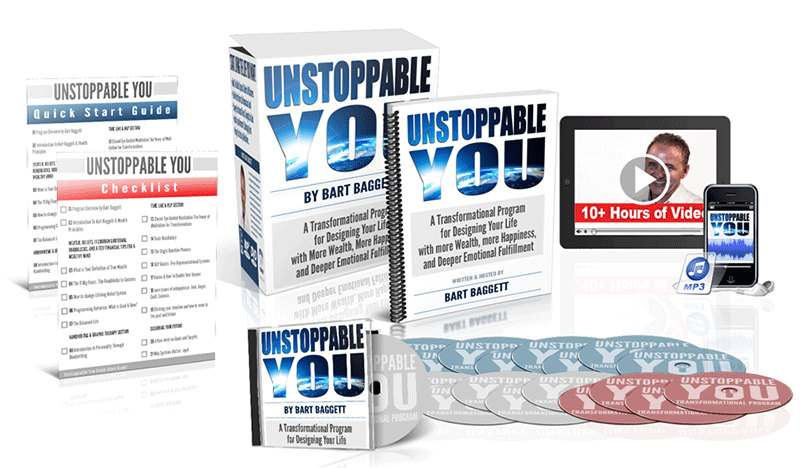 Who is Bart Baggett and how he is qualified to train you to become "Unstoppable"? 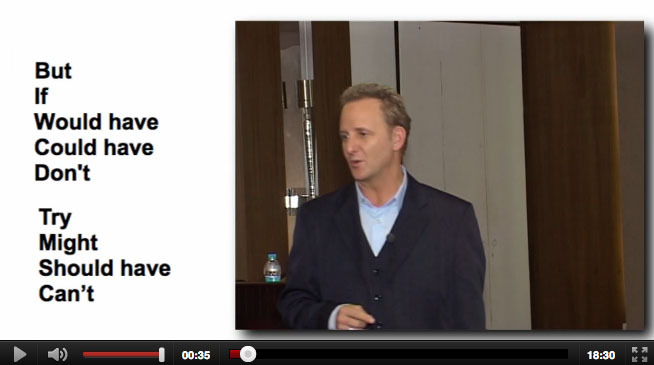 Learn the basic principles of financial success (wealth generation). Module 03: What is Your Definition of True Wealth? Understanding the psychology of money and wealth. 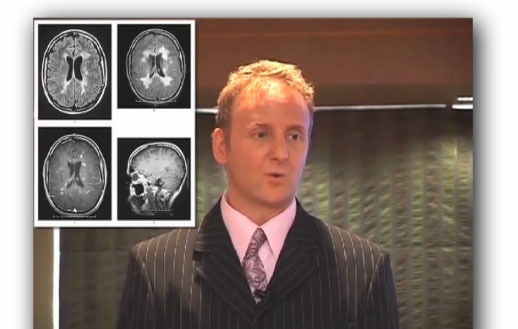 This video gives you systems and reveals the belief systems of the super wealthy. This module alone will pay for this course. What are the primary fears that can inhibit your success and personal growth? Discover how to spot and overcome the 8 most common human fears. One of the most essential, but difficult, things to do is to change a lifelong belief system that has been holding you back from love, money, success, or freedom. The downloadable manual will guide you through every video. Module 06: Programming Optimism. What's Good and What's New? This simple game that you can play by yourself or with friends and family, will change your life and only takes 3 minutes a day. 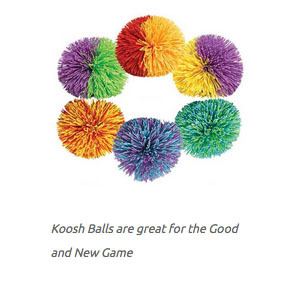 This simple game can turn a bitter teenager into a laughing happy adult. 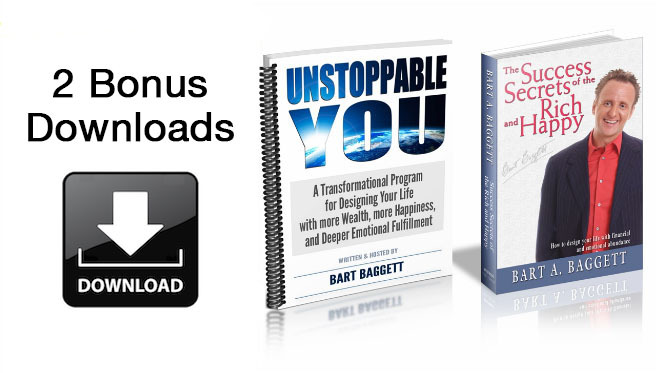 Based on Bart's Success Secrets book, this simple system assist you in living in all the key quadrants of your life without stress and without overwhelm. 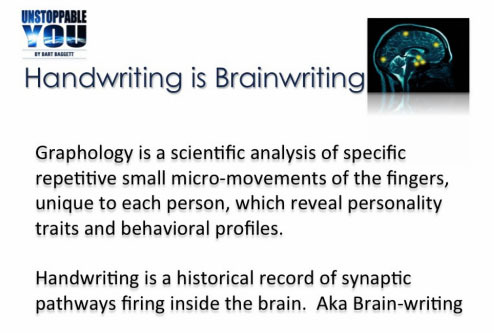 An introduction to handwriting analysis and graphology as a tools for self improvement and success. 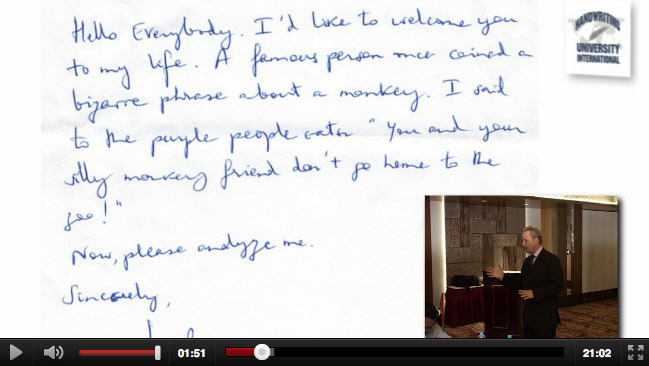 Even veteran handwriting analyst will enjoy this never before seen short lecture. Understanding and defining what success means to you and charting your goals in a whole new way. This is based in NLP and it is 100x times more effective than just writing down your goals once a year. Video Case Study. What success traits appear in this man's handwriting? 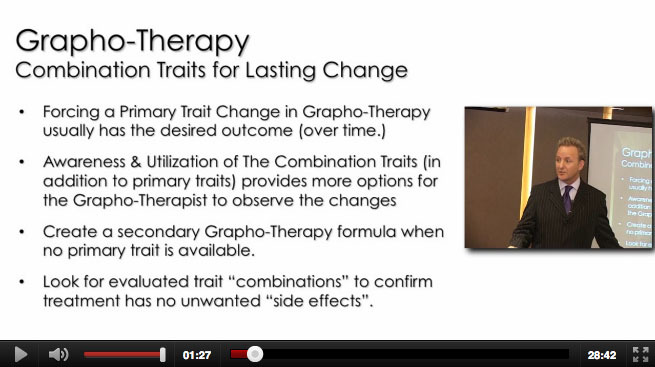 The science behind Grapho-therapy and neuroplasticity. This video helps you understand why it is so effective and how to explain it in a scientific way. Advanced discussions on grapho-therapy. How to change your handwriting to change your life for the better. Simple, but VERY effective. Understand why guided meditation is so effective. This is a great video companion to the Fearless Livinng and all Neuro-Audio Therapy audio recordings. Relax and get motivated at the unconscious level for more success. Listen to a brand new closed eyed meditation lead by Bart Baggett. Learn a single never-before-released 1 minute per day technique to create more love, happiness, and success. This new technique is so easy to learn that parents can teach their kids in 5 minutes and program optimism. Perfect for anyone wanting to double your income, get a promotion, improve relationships, or simply experience more joy on a daily basis. This lecture was the basis of his #1 best selling book. 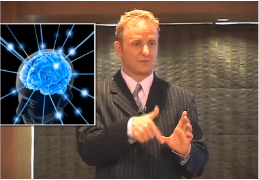 A practical introduction to Neuro Linguistic Programming and the Five Representational Systems. This is classic NLP taught in an easy to understand system to incorporate into your own guided meditation and daily goals. What is the connection between your values and your income? Once you discover this, don't be surprised if you double your income using this technique. 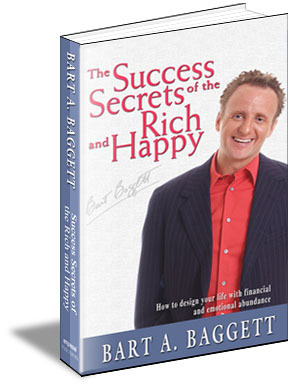 Bart's entire 436 page book Success Secrets of the Rich & Happy is included here as a FREE BONUS and 7 chapters of the audio book, read by the author. This section will change your thinking about money and your career. What are the four core emotions of most people's emotional pain and suffering? 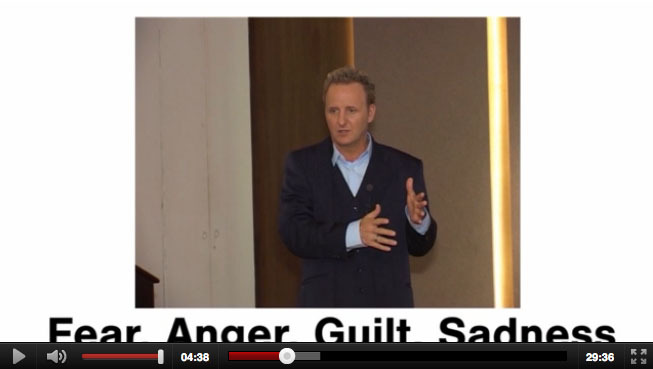 Learn the best ways to deal with negative emotions and finally break free to be happy. Goal setting is very important... but the old way simply doesn't always work . See this unique twist on setting goals and letting your unconscious find the solutions. Detailed systems are at the heart of any efficient lifestyle. Find out why. Over the past twenty years, I've been secretly "training my brain" to find reasons to be happy, focus on the positive aspects of life, and build strong neural pathways using little known techniques that I've never shared with the public. The result has been a "re-booted" brain which now has found ways to be more successful, more happy, and more successful than I would have otherwise experienced. I want to share with you what I've learned. It's a intense, entertaining, and enlightening program. Inside this program I take you through the 4 primary TOOLS that helped me transform from a shy kid with low self-esteem to a successful business man. Plus, I want to GIVE YOU off-the-shelf tools which you can simply DOWNLOAD and LISTEN that makes change fun an easy. Inside this program, I guid you to create for yourself a set tools that are written in your own which will help you find your own highest values, program yourself, and erase the unwanted fears and doubts which prevent most people from achieving their highest level of success. This program is based in my 20+ years of experience blending the best techniquest from NLP [neuro-linguisc programming] meditation, hyponsis, grapho-therapy, brain entrainment, and a slew of other modern psychological discoveries that help people make quick and permanent change. 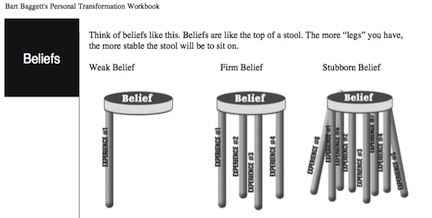 You might have read about some of these techniques in other books, but I guarantee you that there has never been a program that hand selects the most powerful and practical techniques from each area of study and assembles them into one program... which you can put to use immediately. What would it be worth to overcome my 5 biggest fears? What is one technique that could create optimism and happiness in just 5 seconds every morning? What are the 6 minute daily excercise that can change my ability to attract more money, better career prospects, and have better relationships? My name is Bart Baggett. You may know me from my many appearances on shows like CNN’s Larry King Live, Good Morning American, The Howard Stern Show, the Today Show, and even articles in the Wall Street Journal and USA today. I get to travel the globe teaching and training life changing techniques. I have lived a remarkable journey filled with good friends, adventures, and deep sense of purpose that I am making a difference in people's lifes. I want to share with you the tools that made a difference in my life and thousands of others around the world. 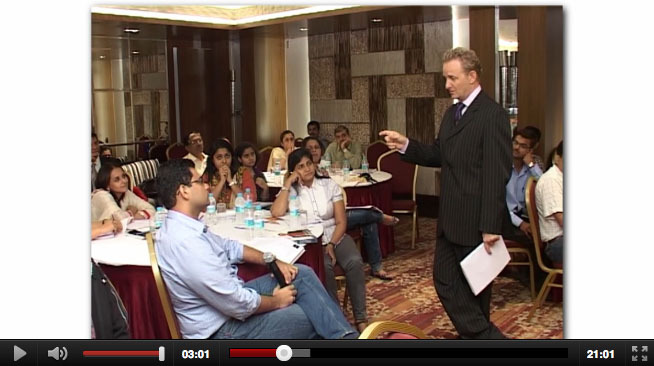 Many sections of the seminar footage you will see was filmed in India and in the USA. This program contains both the entire video and AUDIO MP3 so you can both view and listen to the 23 part personal transformational program. 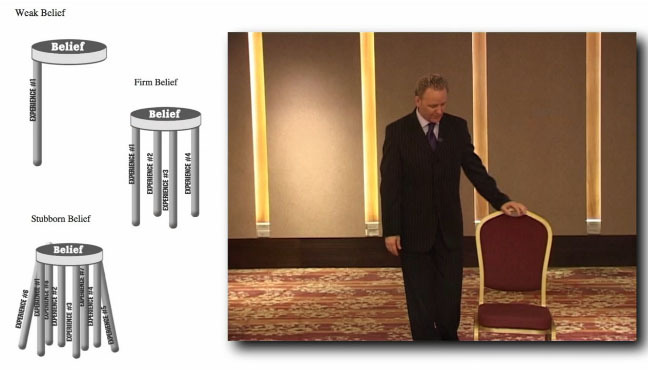 Assembled over 3 years from various live seminars this is a front row seat into the kind of transformational seminars only live participants have ever seen before. 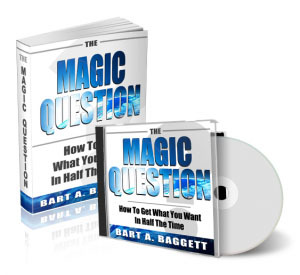 While I have lots of videos on youtube and have had books on the market for 25 years, most of the content inside this course will be brand new... even to the most avid reader of my books. 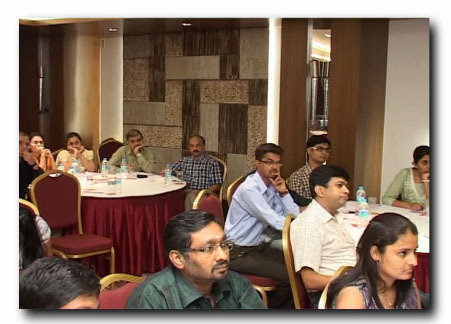 You will notice large crowds in Pune India, smaller crowds and even some clips from live conferences in other countries. I’ve hand selected some of the best lectures that match your downloadable “Seminar Manual” chapter by chapter. But, if you are really wanting to RE-WIRE YOUR BRAIN now and learn to literally THINK DIFFERENTLY starting today... there is a short cut. If you want to break-through your fears, you have to literally change your unconscious thoughts and reprogram your synaptic pathways. 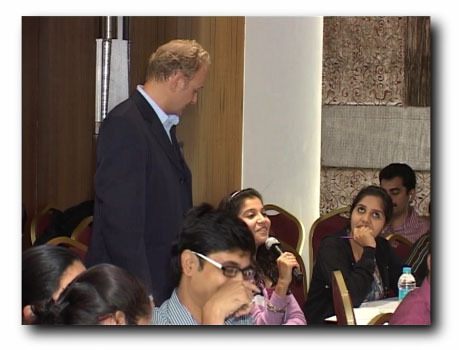 I teach my audiences worldwide how to use internal language based in Neuro-Linguistic Programming and even advanced hypnosis language patterns to quickly change their old rusty thinking habits. There really does exist an amazing set of psychological techniques to overcome doubt, reduce fears, and truly boost their confidence. I highly recommend that you have this seminar manual nearby as you watch or listen to this program. This is interactive in nature. I suggest you fully commit to watching through videos or listen to the audios as if you were sitting live in the seminar. The manual you will download is filled with fill-in-the blanks pages and in depth scientific articles... just like it was in the live event. This will be a valuable resource to you for years to come. What's more... you will do specific excercises in your own handwriting inside the manual... which will ONLY related to your life, your goals, your values, and help you get MORE of what YOU WANT. In each chapter, you will discover something new about how your mind thinks, and why you have been getting the results you have been getting up until now. What's more, you will have a simple pain-free plan to make changes at your sub-conscious level. This program will help you hard wire your brain for happiness. 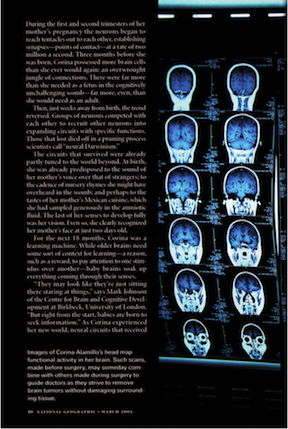 Plus, the manual contains in depth scientific articles that explain why the processes you will be using are based in neuro-science and actual research. This is not "positive thinking". This is a systematic process for conditioning your mind to find solutions, change habits, and start thinking differently from the moment you wake up each morning. When I first published the book, The Success Secrets of the Rich & Happy, I knew inside that book contains the framework for people to change they way they think and thus change their lives. This book is free bonus to this 23 part video course. This book is a useful resource to help elaborate on the core ideas inside the video and give you even more examples of how it applies to you. Even if you have read this book before, this video training elaborates and brings new stories, new examples, and new techniques that are not included in the book. It brings the book to life in a whole new way. Despite the many thousands of books I’ve sold and hundreds of kind emails and letters of appreciation, I know a book just doesn’t get most people to have the kind of emotional experience that a seminar can have. 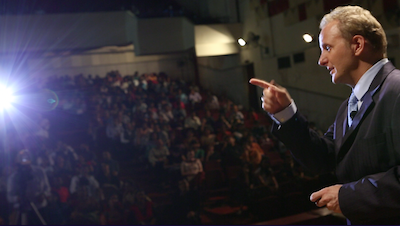 Therefore, this program is a compilation of the best live events from around the world where I teach, explain, and guide you through some of the latest cutting edge transformation processes which will help you go from where you are to where you want to be. That being said, the book Success Secrets of the Rich and Happy - How to Design Your Life with Financial & Emotional Abundance is really a companion text book to this video series. I recommend that you keep a copy nearby and read the corresponding chapters to get a step-by-step process and even more clarity on the ideas discussed in the seminar. This book is so important, I am including an complete PDF copy of this book along with six "Audio Book" chapters to make your learning more fun and complete. With these audios, you will have over 15 hours of audio to download onto your smartphone and learn wherever you go. I am presenting the 4 most powerful change processes I’ve ever discovered to move you from where you are to a life of happiness, wealth, and abundance. 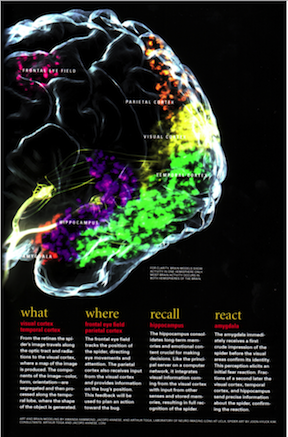 It includes material drawn from NLP, Time-Line, Therapy, Brain Plasticity, and Grapho-Therapy. You would have to master 4 different brain sciences just to get the tip of the iceberg of how I combine only the most essential parts of these disciplines to make them easy and fun to use. I've done all the hard work for you. All you have to do is complete the excercises or sit back and listen to the pre-recorded guided meditation MP3 files to start reaping the benefits of the unconscious programming. People tend to learn faster and retain more information when they have learning experiences through sound, sight, touch, and personal experience. Therefore, only makes sense to teach these ideas using all your senses… listen to the program, read the book, and watch the videos, and fill out the seminar manual in your own handwriting. This is not a seminar where the speaker gives lots of data and you passively listen. This is interactive. At specific times in the video you will see students writing… that means you should stop the video and write in your own manual. If you hear audience members stand up and read what they have written… you will want to make sure you have found that page in the seminar manual and written something in your own words. The power to control my inner voice, manage my emotions, and actually choose my personality traits has been the greatest gift anyone could have ever given me. Before I go on, can I let you in the one thing that can accelerate your progress toward getting your goals and feeling unstoppable confidence even faster? it is the ability to Control your inner voice and change your internal beliefs. To achieve more success, find more solutions, and overcome your fears and blocks... you must master the ability to direct your inner voice and consciously choose your belief systems. This process helps you find and erase those limiting belifes from the past and replace them with empowering and useful belief systems which other highly successful and happy people already have. While you can't control what happend to you in the past, you can control the INFLUENCE those events have on your future. This program helps you do that... and you don't have to spend years talking to a pyschologist or reliving those past traumatic experience or failures. No need for that. Just scroll down and click the blue button below and download the first video. You have a year unconditional money back guarantee. We have been in business for 22 years and our customer service number is 1-310-799-7224 (text friendly). This entire 23 part video program comes with the entire soundtrack exported to MP3 files so you can listen to the program on your smart phone. Because of my background in NLP, Time Line Therapy and Hypnosis, I’m able to guide them to feel more confident and release lifelong insecurities often in less than 30 minutes just with a simple guided meditation session. It will change your life. For the better. Forever. What would it be like if that negative critical voice inside your head changed? And your voice started telling you how awesome you really are... And it stopped pointing out flaws? Do you wish you could speak up and ask for what you want with no fear of rejection, no fear of humiliation, no fear of looking stupid? 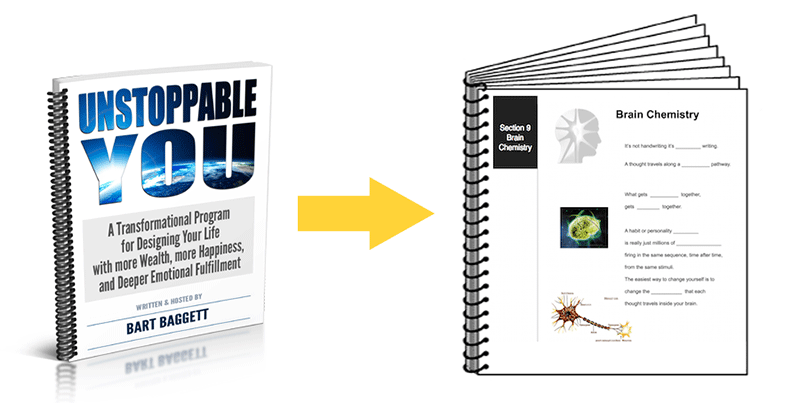 For the first time, I’m releasing this amazing Unstoppable You 23 Part Video Home Study Course. The audio version of this programis also available for you as an audio download so you can listen to it on your phone, iPad, or computer... Anywhere you travel. You can view the streaming video as long as you are connected to the internet. Or, buy the DVDs and own the the discs and audio MP3. 06 Programming Optimism. What is Good & New? You have a 100% money back iron-clad satisfaction guarantee. I know there are some dishonest people in the world that might take advantage of such a generous money back guarantee… But, I believe most people are good and honest, so I’ll take all the risk off your shoulders because I sincerely believe this program will change your life and those of your friends and family for the better. And, just like all of our products, you have a full ONE YEAR SATISFACTION money back guaantee. You can grab Instant Access for just $997 total. $215 for 5 months for the entire payment plan. You get instant access to the program and get up to 5 months to pay the balance in installments.